Wicked beer nice intense head once poured into a tulip. Frothy head and pitch black so light shines through. Light smell some sugars as well as light chocolae notes. Taste masks the alcohol way too well. While it is a bit pricey another great brew from Destruise as well as a nie colab brew from stillwater. Served on-tap at Capone's in a 13 oz snifter glass. A: Dark brown, borderline black body with a very light tan head. Some sporadic lacing is left behind and a thin retention ring lines the edges of the beer. As confusing as the style is, it's a nice appearance that defines both of its parts. S: Spearmint, dark chocolate, spice, floral hops, spruce and pine all intertwine into a complex and delicious smelling beer. Again, an identity crisis seems to emerge but the beer does a fine job of blending everything together. T: An initial spicy Belgian flair is evident with light yeasty notes. Some lightly toasted malts, mint, wood and a touch of sap all come through in the flavor. Rounding out the back end is a touch of sticky syrup. It's unique, complex and oddly very good in terms of flavor. M: Prickly and bubbly, almost on the lighter end of a medium bodied beer. Although, the finish is really nice and clean, that almost has a certain crispness to it. This was certainly an interesting beer and the cross between the styles really make this unique. I enjoyed the floral, piney and hoppy nature of the beer with the dark roasted malts. Some defining flavors that took this above my expectations. T - you get hit with roasted malts and chocolate right away, but again, not much hoppiness. M- medium bodied, light carbonation. Nice collab, and I hope to see more in the future. Picked up a bunch of these from Dranken Geers in Ghent. Poured into a Westvleteren chalice. Pours dark brown to black. Starts out with a nice one finger tan head that goes away after a minute. Smells of sweet malts but also a sweetness and some faint hints of roasted malts. Taste is sweet candy like, barley, rye and darkfruits. Loads of flavors. The 10% abv is hidden very well. Mouthfeel is creamy and very smooth. A medium amount of carbonation and a medium to full body. Great Struise and Stillwater brew. One of the most surprising beers I have had in a while. Full of flavor and extremely smooth but not one I'd drink all night. This one to safe for special occasions. Recomended. A: Pours a dark brown with lots of floaties. Big fluffy medium brown head. Fades slowly leaving tufts of fluffy lacing on the glass. S: Prominent raisins and earthy belgian yeast. Has a roasted malt character though I think - a little chocolate in there? Nice combination, like a bsda and a porter mixed together. T: Nice mellow fruitiness up front with some raisin and fig. Turns bitter in the middle with a little bit of chocolate and a hint of char. Very earthy in the middle and into the finish. My mouth feels dirty, almost. Hints of dark fruit and chocolate in the lingering aftertaste. M: Medium bodied, not nearly as heavy as you'd expect for 10%. Fairly smooth. O: This is a tough one to rate. It's basically a BSDA and a black IPA combined I guess. Decent roasted malt, decent bitterness, decent earthiness to boot. It's got good flavors and an even better aroma. But somehow it just doesn't quite work for me and I can't exactly place why. Just an odd mix, albeit unique. A: Pours black/dark brown, just under 1 finger light brown head that quickly dissipates. No lacing. S: Tart dark fruits, very vinous, very similar to black albert minus the overload of chocolate (it is here though) and with more hops. Sweet, red wine, cherry, hint of rum. Raisins. Totally awesome nose. Completely took me by surprise. T: Tart cherry and dark fruits, floral hops (with some citrus, though hard to pinpoint). Very vinous. Slightest bit bitter, very sweet. Lightly roasted malts, almost like a like RIS without harsh bitterness or char. Dried candied dark fruits. Fairly sweet finish. M: Medium to light body, moderate carbonation. A little sticky/resinous, but not very much. Pretty smooth. O: This was one hard to describe and hard to categorize beer! While some list it as a BSDA (as would I), a lot of people call it a black 'IPA' because of the strong hops. I'd say it's somewhere in between. A pretty awesome brew that I'll look forward to getting again when I can. A - Creamy tan head with fantastic retention and nice lace. Cherry cola body. S - Surprisingly bright, tart and tangy sour cherry. T - Wow, just like the nose the taste is exceptionally bright. Concentrated cherry cola, brown sugar, and pop rocks. Aggressive sweetness. Lightly tart backend. M - Lively carbonation and a medium frame. Thick sweetness. O - A really interesting flavor profile, I can't say I've had a beer like this before, but overly sweet. A 330ml bottle with a BB of Feb 2016. Bottled on 1/1/11 (?) - New Year's day? Acquired from a Belgian webshop and cellared in my garage for quite a long time. A collaboration brew between De Struise and Stillwater - a blend of Belgian strong dark ale and US black ale. 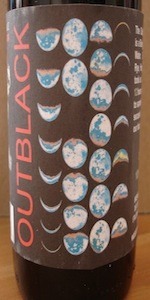 Not sure what the bizarre eclipse picture on the label is supposed to represent. Poured into a Duvel tulip. A thick layer of yeast sediment clings to the bottom of the bottle. Dark brown; appears totally black in the glass. Produces a huge head of creamy tan foam with great retention; this slowly reduces to a thick surface layer. Aroma of sweet, faintly fruity malt with a herbal character. Notes of brown sugar, dried fruit, mild liquorice and hints of coriander, peel, bay leaves, eucalyptus, rosemary/thyme and earthy yeast. A warming whiff of booze in the background, though this blends nicely with the other aromas. Tastes of rich dark malt with a fruity, herbal character and a dry, bitter finish. Notes of molasses, brown sugar, roasted malt, coffee/cocoa, coriander, orange peel, herbs and earthy yeast. A warming, solventy hint of alcohol in the background. Pretty dry, with a restrained bitterness upon swallowing. Mouthfeel is thick and smooth, with a spicy quality. Feels somewhat flat and undercarbonated. Rather astringent, with an aftertaste of sweet malt and a herbal bitterness. Unusual - rather hard to place this beer. To be honest I have a hard time even picturing the style that this is categorised as, which doesn't help. It's big and well crafted, just odd. The herbal notes are the mystery, as the ingredient list only mentions grains and hops. I was expecting more of a black IPA character, but perhaps the hop aromas have faded and left a herbal flavour behind. Sweet, fruity and boozy, but dry and herb-like. I'm surprised there isn't more of a yeast ester presence. Overall, it's charismatic but weird. Worth trying once, though I'm not sure I'd revisit this. Beer is black with a large tan head that fades to a film. The smell is very unusual. Anise is prominent, along with candied ginger and sugar. Roasted malt as well. Very distinctive but not really up my alley. Like the nose, the taste has a lot of anise in it. Ginger as well, and roasted malt. Somewhat bitter, but with some sugar hints. Overall, pretty unusual but not my bag. I did not like the anise flavours. I like De Struise a lot but this one is not for me. Poured at lord hobo in cambridge. Pours dark black with a tan head that was light. Smell is of cherries and chocolate with a floral aroma. Different than anything I have smelled. Taste is of tartness from cherries and then transitions to a bitter floral nature from the hops and chocolate. Mouthfeel is smooth, medium body. Not much carbonation. This is an interesting combination for me, as I adore cherries and dark chocolate. I would drink this again and again. I picked this up on the fly simple due to I liked the label and have enjoyed many other De Struise brews in the past. T = I immediately sense that unique Belgium flavor. Sweeter than expected. Rich and somewhat creamy. I do not taste the mint or cherry's other reviews have mentioned. M = I love it! Super silky. This texture and consistently is what I enjoy in beer. It has a smooth velvet like characteristic. Quite pleasing. O = Another great beer from De Struise. Being the 1st time I tried (even heard of it) I'm thrilled to say I really enjoy it. I will certainly be tracking down another 2-6 bottles for future enjoyment. Pours with very minimal clarity and an excited medium brown head. Milky, stubborn consistency with decent lacing. Head is incredibly dense, like insulation. The nose is scattered with caramelized sugars. Honey, oats, milk duds, not much of an alcohol presence, cocoa, brown sugar, hot chocolate bits. Taste is extremely unique. The nose suggested something run of the mill but this is far from it. Grapes and booze up front... all those various chocolate hints don't show themselves as clearly on the tongue. Some Belgian yeast surfaces after a bit of warmth. Very interesting. Overall, this is exactly what I want from a pricey brew - not a textbook example of the style, but an adventurous take on a genre that you thought you knew. Very good. Dark and brooding. . . a beer to be reckoned with - if you don't dive in and figure this beast out, this beer will be lost on you. But those with the fortitude will be amply rewarded. Thick pour of espresso color with a head like you would expect from a double-shot. Big malty molasses on the nose with wonderful scents of smokey hops, honeysuckle, herbs (thyme, oregano, and a bit of lavender), and ash. The palate is intensely dark, dry, and slightly bitter with tons of ashy molasses flavor. The nuances are where the beer really excels with notes of cacao bean, smoke, Christmas spices, and butterscotch all framed by a nice lift everything so things don't get too heavy. The malts continue all the way through the finish as smoke and ash linger on the back end. At first taste this beer is a tad overwhelming. But once you sit and break this motha done, it is complex enough to keep your attention. That being said. . . it needs your attention.